Once the download is complete go to the backend of Joomla. Navigate through your menu system to Extensions/Extensions Manager. Once at the installation screen click the browse button and navigate to where you downloaded the template file. 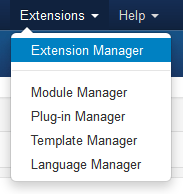 Navigate through your menu system to Extensions/Template Manager. Find the radio button next to the newly installed template. Click on the Default button at the top right of the screen and you're done!